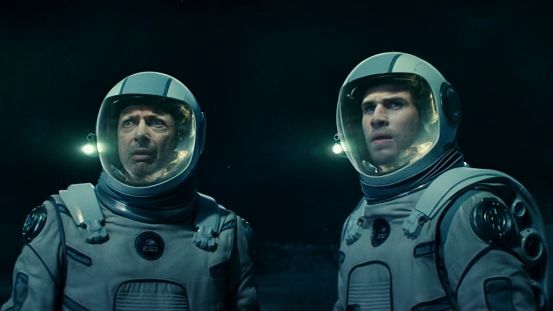 STRONG SUITS: Goldblum (left) and Hemsworth in a scene from the film. “That is definitely bigger than the last one,” notes Jeff Goldblum’s David Levinson. The eccentric scientist is referring, of course, to the massive spaceship that’s just arrived to unleash mayhem and havoc on earthlings. Two decades earlier, Planet Earth managed to stave off a serious alien invasion that threatened to forever alter life as we know it and now they’re back, so we are bracing for war again. Will we be as lucky this time around? That’s the basic gist of Independence Day: Resurgence, director Roland Emmerich’s bold, brassy, big-budget sequel to the film that helped cement Will Smith’s status as a major action hero. But while Vivica A. Fox makes a cameo appearance, Smith is nowhere to be found in this super-loud, reasonably entertaining follow-up. Instead, we are introduced to their courageous son Dylan Hiller (played with enormous assuredness by newcomer Jessie T. Usher) who, along with a team of space cadets, including Liam Hemsworth’s Jake, are tasked with taking the fight to these unwelcome extraterrestrial guests. Bill Pullman, Maika Monroe, William Fichtner and Sela Ward (as the tough-as-nails US President) round out the main cast.